The holidays are over and the new year is upon us. 2008 is a very special year for the Grange in Connecticut and the other Granges in the Northeast. The National Session will be upon us sooner than we think and there is much work to do. After the January planning session of the Northeast State Granges, which will be held at the New England Leaders Conference in New Hampshire, more information will be passed out, including the list of needs for volunteers. I know many of you are ready and willing to help. The November Pink Sash meeting was well attended as the Directors met with their committee’s and laid out their plans for the coming year. You will be able to read of them in the new Blue Book, which should be out at the same time as this edition. At this meeting I outlined a new procedure for evaluating the Community Granges. There was even a short piece on it in the December publication. All the details will be presented and questions answered at the Pomona Schools of Instruction. The dates, times and locations are listed in this edition and I am sure the Deputies are contacting their Community Granges. At these schools I will also be discussing some of the programs, aids and policies of the National Grange. Many of them can be of use to the individual Granges if they choose to use them. Remember that the National Grange and your State Grange want to assist you and many policies that appear to be from the top down are actually developed and presented from the bottom up. 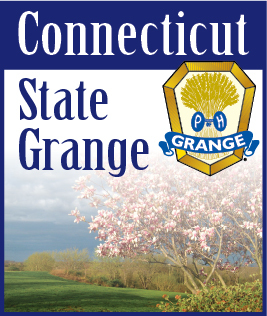 You, the members, are the State and National Grange as you will be able to see this first hand this year when the National Grange Session takes place in Cromwell, Connecticut. This is a wonderful opportunity for those of you who have never been to a National session to see the workings of the Grange and how it’s policies are formulated. You will also see the Youth and Junior Granges in action. How their contests are used to develop teamwork and leadership in our younger members. So find out what the different programs and contests are and plan now to participate. Your committee members and directors are ready to assist you in your endeavors. I know you all are as excited as we are and want to do the best we can for all the Granges in the Northeast.